University of Colombo has seen several antics that would put any academic to shame. 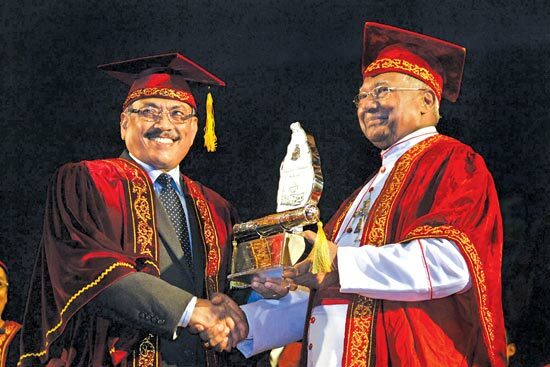 Honorary higher doctorates were obsequiously conferred on Mahinda and Gotabaya Rajapaksa. Senate Members, if the Universities Act had been followed, would have voted for this shameful boot licking. The VC since has refused to appoint as Deans those persons duly elected by their faculty boards as provided for in the Universities Act. 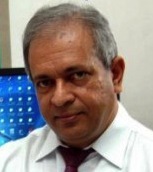 The alleged abuses and violations of the law by the VC have made many Colombo dons who conferred higher doctorates on the Rajapaksas ask for the VC’s removal. And now the dons themselves are flouting the law to uphold the law as this article explains. This provision is no stranger to us and has been exercised before – for example when Prof. K. Wijeratne of Rajarata was removed by the then President Chandrika Kumaratunga after due inquiry into allegations of abuse of office by him. Similarly Prime Minister Ranil Wicremesinghe has promised FUTA at a meeting on 27 Jan. 2015 that he would hold inquiries into allegations against VCs if complaints are made. He mentioned that he had already received complaints against the VCs at Jaffna, Eastern, South Eastern, Colombo and Peradeniya. Thus we may expect that after due inquiry those VCs abusing their authority will be removed. We need to be patient and allow due process to run its course. The legal care with which the government is proceeding shows both its understanding of and its respect for the law. At the said meeting the Prime Minister stated that all UGC Commission members including the Chairperson will be requested to resign through letters that will come through the Secretary to the President. This is because the President is the appointing authority for UGC members. Similarly, since the UGC is the appointing authority for Council members, Minister Kabir Hashim is handling the demand for their resignations. Although the Rajapaksa regime simply ignored the law, the new government in standing up for the rule of law is respecting the lawful operation of the law – not flouting the law to uphold the law. That this new government respects the law is also seen in the care with which the Chief Justice has been removed. For supporters of good governance, nothing is more important than upholding the principles for which we fight and for which we elected this new government. Unfortunately, however, the University of Colombo dons do not see this. “At the start of the Senate meeting yesterday chaired by VC Dr. Hirimburegama, some members wanted to discuss the letter that CUFTA and AFTA handed over on Jan. 22. “The Senate members asked [for] the consent of majority to discuss the letter [about the VC] after Dr. Hirimburegama refused to discuss it as it was not on the agenda of the meeting and walked out. Thereafter the meeting continued with Law Faculty Dean Thamil Maran chairing it. This is mob rule because the Universities Act (Article 34(2)) says that the Senate is chaired by the VC. There can be no Senate meeting without its chairman. Law Dean Thamil Maran should have understood that members of the Senate cannot make him the Senate Chairman. Further, Section 46 of the Act clearly sets out that the powers of the Senate relate to academic matters. To decide on who should be or should not be the VC is not the Senate’s business. University Senators should know this. The resolution cannot be a Senate Resolution as characterized in The Island. It has legitimacy only as a resolution by a private meeting of senior academics of Colombo. Indeed, if the VC is out of line, as stakeholders and individuals, members of the Senate have the right to file complaints and seek the removal of the VC as provided for in Section 34(1)(c) of the Act, but not the right to have meetings of the Senate outside the provisions of the law. Let us give the government the time and space to do things properly. Now that the Prime Minister has promised us inquiries, it is a matter of time before the bad VCs are sent packing. Indeed, 100 days is not a long time to wait without taking the law into our hands. I appreciate the letter but when the law has been ignored in an appointment then there is no need to be an inquiry, a case shown by us at Eastern University, where the applicant for VC position was under VOP from the University and a non citizen whose application could not have been accepted in the first place. In relation to this article, it is true that we should not break the law and section 34 needs to be followed for removal. But any authority has the right to state that they are not in agreement with the chair as he/she had violated norms of that authority and request for resignation or removal accordingly. further the issue of Senate being academic authority is accepted but that does not make it irrelevant for them to discuss other issues. This is a wrong interpretation. We( senate) sends two representatives to the COUNCIL to represent us and the representatives have all the right to request a discussion of the senate which is then communicated to the COUNCIL. They are the only two who represent senate at the Council. IN the same line the Faculty has the right to discuss the matters in relation to various issues in the university and report to council through their representation, the DEAN of the Faculty. The failure to understand the representativeness is one of the main reasons that the councils are able to some times work in islation and claim that they are not subject to any other bodies which is incorrect. If the representations work democraticlaly then the entire university gets involved in the decision making of the council, by default. This has to be understood and encouraged. Very good. There are a huge number of donkeys and idiots waiting to indulge in what they themselves claim to oppose. According to these thugs and goons “our governance” is good governance and “their governance” is bad governance even if both are the same. Dear Academics of Sri Lanka, here is an interesting question for you. Why a person who claims himself as one of the Guardians of the academia in our Country could not get enough votes to become one of the three names for VC post even though he continued to apply at Eastern University? There are allegations against all VC’s because all of them are appointed through ill-gotten means. Just because their loyalty to SB Dissanayake or Rajapakse and not because they are the most qualified to do the job. And what have they done since becoming the VC? Take agenda items of the council meetings. Just helping their friends. Attempts have been made to remove punishments imposed on their friends by the University for wrong doing and financial fraud. Also trying to get the promotions not granted by appealing. The report in The Island of 29th January on what transpired at the Senate meeting has got some details wrong, and these were corrected at a Press Conference by the Head of CUFTA, the next day. What actually happened was that union members requested a discussion of the contents of a letter handed over to the VC because he had not responded in any way until then. The VC did NOT walk out of the meeting, he requested the Law Dean to chair the meeting as it would not be appropriate for him to be in the room while members were discussing a show of no-confidence against him, and left the meeting saying he would return after the discussion was over. And the VC did return, to take up routine matters for discussion. Thus there was nothing “unlawful” about the Senate meeting. There was a Chair at all times, and Mr Ratnam, seeking the removal of the VC IS an academic matter, as there is plenty of evidence that he has actively worked against good academic governance of the Institution. The Senate therefore had every right to request a discussion on this, which the VC initially denied. Finally, no resolution or motion was passed, as The Island report claims, as this was a Senate meeting, not a Union meeting. Give the most senior body of academics in a University some credit-they are neither mobsters nor rabble rousers as this CT article seems to suggest. dr.mohan ! Why you didn’t mentioned about the money deal between present vc and some council members ~2 lacks each. I have the evidence those money transfered through DR bakeerathan. johnypappa when you changed your nickname. you have previously used your name as Tamilkirukkan. anyway all the best. Johnypappa!! I am not saying the previous vice chancellors.. they are genius, pure academics with high quality . we were much proud about the previous VCs when they are in the VC post.we can’t compare them with (You)present VC kobi. don’t try to compare the present VC with the previous qualified experienced VCs. go through the http://www.esn.ac.lk and see the academic and research quality of the kobindarajah. what a shame to have such type of VC for the EUSL. The Island report of 29th January on what transpired at the Senate meeting has got some details wrong, and these were corrected at a Press Conference by the Head of CUFTA, the next day. What actually happened was that some Senate members requested a discussion of the contents of a letter handed over to the VC by the union because he had not responded in any way until then. The VC did NOT walk out of the meeting, he requested the Law Dean to chair the meeting as it would not be appropriate for him to be in the room while members were discussing a show of no-confidence against him. He left the meeting saying he would return after the discussion was over. The VC did return, to take up routine matters for discussion. Thus there was nothing “unlawful” about this Senate meeting. There was a Chair at all times, and Mr Ratnam, seeking the removal of the VC IS an academic matter, as he is the academic AND administrative head of the Institution, and there is plenty of evidence that he has actively worked against good academic governance of the Institution. The Senate therefore had every right to request a discussion on this, which the VC initially denied. Finally, no resolution or motion was passed, as The Island report claims. This was a Senate meeting, not a Union meeting. Give the highest body of academics (Deans, Heads and Professors) in a University some credit – they are neither mobsters nor rabble-rousers as this CT article seems to suggest.